Centennial Parklands’ horticulturalists created impressive display gardens in collaboration with Royal Botanic Garden Sydney, Blue Mountains Botanic Garden Mount Tomah, and the Australian Botanic Garden Mount Annan. 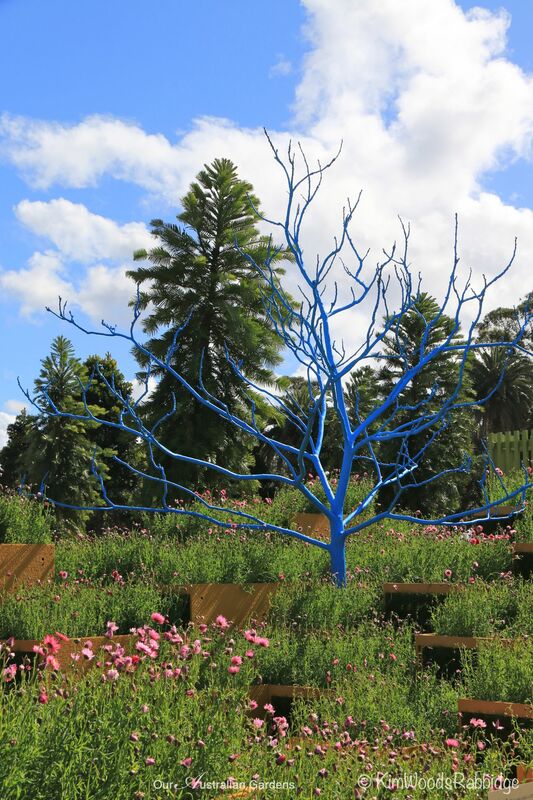 This one includes rolling hills of golden kangaroo grass and paper daisies flowing beneath a mini replica of the ‘Blue Ruin’ – in this case a dead African Olive tree (a weed in Australia) that’s painted blue. It’s a reminder that dead trees should be left in place, where possible, as they provide shelter, perches and nesting hollows. The second AGSS, held last weekend in Centennial Parklands, was a fabulous event despite the rain – and that followed blazing heat at the same time last year! I had lots of sympathy for participants and organisers. The publicists were a bit cheeky describing this fledgling event as “the leading floral, gardening and lifestyle show in South East Asia”. (Did they mean ‘Australasia’?) And maybe it’s just omnipresent Sydney – Melbourne sibling rivalry because the well-established MIFGS (Melbourne International Garden & Flower Show) has been the most popular event in Australia, and even Nambour’s Garden Festival in regional Queensland is significant (35,000 visitors); plus others include the renown Singapore Garden Festival and Ellerslie Garden Show New Zealand. Any garden event we applaud, especially when our designers’ work is on display, and the central Centennial Park venue hopefully will continue to host this event that’s wonderful for horticulture, and for Sydney. Here are two of eight show gardens from ‘The Inspirational Gardens’ section – more to follow next post. Myles Baldwin‘s OPEN WOODLAND which won ‘Best in Show’, and THE PAVILION, a design by Peta Donaldson, which won one of the Silver Medals. Constructed by Modify, OPEN WOODLAND was designed to blend with the slope of the land, working with cut and fill principles. Open Woodland’s pavilion, cantilevered over a central pond, was constructed from steel angle and cedar battens. Cantilevered pavilion over the pond. Shrubbery, perennials, European fan palms and a pair of Magnolia stellate softened pockets, and spilled over the retaining wall. European fan palms made a lush plant palette at the back of the pavilion. Washed decomposed granite sparkles, and interspersing stone strips add rhythm and texture. THE PAVILION, designed by Peta Donaldson, Natural Design, and constructed by Green Art Gardens and Andrew Edwards Landscaping was a fresh, crisp landscape inspired by mid 20 Century style. Handmade tiles surround the tempting plunge pool overlooking the garden. Magnolia ‘Vulcan’ made an attractive feature. A constant theme of lineal versus circular forms creates easy juxtaposition. Circular pavers lead onto rectangular slab pavers. Open sides create an airy pavilion. We’ve six more designers’s gardens to follow. Keep an eye on your inbox! The tree looks quite good.. must remember that if we are unfortunate enough to be in the same situation. Loved your photos of the garden show. It was almost like being there.